Authors: Paul Torrey, Philip F. Hopkins, Claude-André Faucher-Giguère, Mark Vogelsberger, Eliot Quataert, Dušan Kereš, & Norman Murray. First Author’s Institution: MIT Kavli Institute for Astrophysics & Space Research, and TAPIR California Institute of Technology. Paper Status: Submitted to MNRAS. Star formation is a crucial part in modern astrophysics, and is a tricky business. From the observed Kennicutt-Schmidt law, we learned that on large scales only a few percents of gas actually turn into stars. Therefore, star formation is a highly regulated process – gravity has to compress gas to high densities to make stars, but not too much. Astronomers have been striving to understand the inefficiency, and have come up with two main ways to avoid making too many stars. (1) Stellar feedback, i.e., the injections of energy and momentum into the interstellar gas from stars, is able to significantly reduce the gas supply available for star formation. (2) Supersonic turbulence, i.e., very fast random motions of gas, can also provide support against rapid gravitational collapse in star-forming clouds. We are able to reproduce the observed low efficiency of star formation using models with feedback and turbulence, but they may not be applicable everywhere in the Universe. In typical analytical models, the efficiency of star formation is derived from a stable equilibrium star formation rate. This simple picture assumes that feedback and star formation are perfectly in-sync: when star formation rate is below (above) the equilibrium value, the weakened (enhanced) feedback follows instantaneously; and the weakening (strengthening) should in turn cause and increase (decrease) in star formation, bringing it closer to equilibrium. However, when they do not coevolve, most of these analytical models break down and no equilibrium star formation can be established. Today’s paper explores the non-equilibrium mode of star formation around galactic nuclei. Using analytical estimates and numerical simulations, the authors show that star formation near galactic nuclei is highly unstable and bursty, consists of cycles of gas expulsion and recycling. To understand this, let’s first review the typical timescale of stellar feedback. 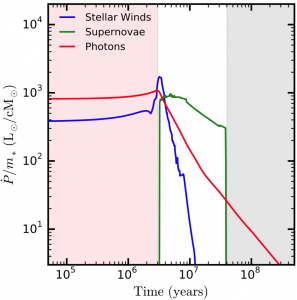 Figure 1 shows the time evolution of the momentum input by three main types of stellar feedback: radiation pressure, stellar winds, and supernova explosions. Feedback by radiation pressure dominates the first ~3 Myr before being taken over by supernovae. Overall, we see that stellar feedback lasts for ~40 Myr. Close to galactic nuclei, the central supermassive black holes circulate gas rapidly with orbital periods of less than 1 Myr. The latter is also known as the dynamical time, which characterizes the timescales for the readjustment of gas in the disk. The short dynamical time allows stellar feedback to outlive the gas readjustment and blow away most of the gas around the center before the stars die. Figure 2 shows this in action from one of their simulations. At first, a large amount of cold gas (shown in purple) gathers around the nucleus and forms stars. 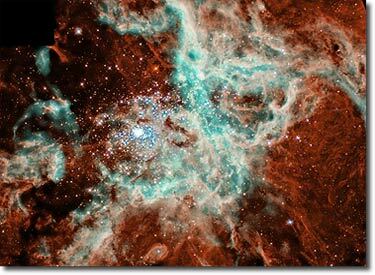 Once enough young stars have formed, the intense feedback clears the central region, keeping it gas-free for ~30 Myr. During this time the disk has no chance of forming stars. After ~40 Myr, the feedback dies with the stars, which allows gas to gather around the nucleus again for a subsequent episode of star formation. When averaged over longer periods of time (~1 Gyr) or larger spatial scale (~1000 pc), the star formation activities in the simulations are more steady and are consistent with the equilibrium analytical models. In practice, observations of star-forming sites do not provide information as detailed as we have in simulations. Estimates of gas density and star formation rate may be all we have. It is therefore insightful to know the implications of the bursty mode of star formation on the observed Kennicutt-Schmidt relation. Figure 3 shows the ‘observed’ Kennicutt-Schmidt relation in the nuclear regions of the simulated galaxies. Points of different colors superimpose the results from runs with three different initial galaxy masses. A reasonably tight relation is observed on large ~1000 pc scale (right panel) with slopes consistent with the empirical relations (dashed lines). On 100 pc scale, the scatter is much larger due to the episodic star formation events. The apparent shift towards the left is introduced by plotting the local gas surface densities, which may have been underestimated due to the evacuation of gas by the newly formed stars. The current paper looks into the dynamical star formation near galactic nuclei, focusing in particular on the highly unstable combat between stellar feedback and gravity. The numerical simulations incorporate a suite of realistic feedback models. To ensure an unbiased interpretation of results, feedback from the central supermassive black holes, which is believed to be important, is turned off. Nevertheless, this phenomenal work is undoubtedly a giant leap towards an unexplored territory in star formation theory. I am a graduate student at the University of Texas at Austin working with Prof. Milos Milosavljevic. Using Texas-sized supercomputers and computer simulations, I focus on understanding the effects of radiation from stars when massive star clusters are being assembled. When I am not staring at computer screens, you will find me running around Austin, exploring this beautiful city.